For today, a big new group of BMW Morocco was announced. Everyone was very excited. People live here and had to be absolute profesional about their driving skills. At last they appeared on the horizon and saw the passage of the river at the old fort. The first man let his engine up, gave a powerful gas and shot down the hill. The water spurted up as he steered his machine into the water without hesitation. He steered his brand-new BMW R 1200GS LC safely (yes, BMW now also supplies it with water cooling) and put her full pot against a rock. According to German standards, the machine with its warped ramen was certainly a total loss afterwards. For Moroccans, however, no problem. The leaking water cooler of the LC was swiftly bridged by a piece of garden hose (so it was cooled again to the air) and the broken plastic parts we stuck with stickers from the Sahara camp. The flat tire was quickly flooded with tire pilot. Of course, the RDC tire air pressure control system did not work anymore. No one needs a lot of nonsense. Photos were taken diligently to flood all channels of social networks with these heroic deeds. The next day I took the whole group to the hot spring. So a huge group develops an amazing momentum. Since each of the Moroccans in turn had bosses and subordinates to whom he had to obey, instructions from me were implemented only very delayed. So it took 2 hours after the official departure time alone, until everyone had his motorcycle clothes on and we really sat in motion. When spontaneous participants from the group wanted to break away, they were accidentally followed by half the group like sheep on their way to the butcher. The Moroccans made every effort to entertain me with spectacular casualties partly from the state etc .. Most of them seemed to have left the asphalt for the first time. We had a lot of fun at the source. Then it was delicious food and then with the giant snake to the former Dakar Rally "Plage Blanche". Most of them did not even get the driveway and would rather wait for my return. With the rest, I then dew at low tide to the shipwreck. The adult men were happy about this tour like little children. Today is the best day of her life. Of course, such praise goes down as the delicious honey we always get for breakfast. I'm sick today. It was probably the last few days a bit too much stress. Nevertheless, my tours naturally take place as planned. It is once again Saturday and therefore time for a highlight: the camel market, on which you get everything else, such as goat heads. Unfortunately, not all participants can accompany us. One has a very strange mistake: Every time he turns on his Navi, his ABS reports an error. Without Navi he did not want to drive and without ABS it was too dangerous. Another man has a flat tire, but does not get his bike removed, since normal tools do not fit and Torx tools in the Sahara desert are of course deficient. Finally he gets the screws out yet. One participant had special tools with him. As a basis for his motorcycle are used in the camp ubiquitous catalogs of the company Touratech. Lucky we had them with us. Unfortunately, the air of the tire seems to degrade through the spokes of the KTM 1190. The rim tape seems to leak. Unfortunately, we did not succeed in getting a hose suitable for such large machines in Morocco immediately. In Morocco, there are really only small 125cc, which do not get stuck in the sand, etc. Today my yellow rally machine was sick. After many participants and I had made her great tours, she just did not want to start in the morning. The participants were in full gear and the tour guide's bike did not start. I already know why I drive privately for years Honda. The guilty one was quickly found: the spark plug. Although I did not ask anyone, I got a lot of money. Advice is also punishment. My guess was more in the direction of gasoline pump. The familiar whirring when switching on the ignition was missing. This guess was quickly swept aside. At the exhaust, it smells (very weak as with any motorcycle) of gasoline. I should unscrew the spark plug. Since one was agreed. I refused and sent the group off without me. Christoph knew the track and spontaneously jumped in as a tour guide. Then I started looking for the fuses on the rally machine. The mechanic of the camp's Stromagregat kindly lent me his tools and helped unscrew the tank. My suspicion was confirmed: The 20A fuse of the fuel pump had blown. Presumably, dirt in gasoline from the barrel had blocked the pump for a short time. Quickly we replaced it with the 15A fuse of the horn. Who needs that with the loud exhaust? Then the rally motorcycle jumped on as usual. Now I had time to take care of the promised driver training on the website. She had not dared to go on the off-road tour. Together we practiced Enduro driving at the old fort. She talked about her "safety ring" on the left hand, which effectively protects her in Moslem countries from intrusive men. In the evening I was a bit surprised, why two new participants in our funny round the waiter always my name to call. To bias! The waiter understood and brought two beers ;-) Alcohol is not a matter of course in Islamic countries. In the camp, however, there was plenty. Other things were possible in the camp. Even if open jokes were made about it, Gerard was able to deliver within 5 days even new tires for here absolutely exotic giant motorbikes by bus from Casablanka. These can then either be installed in Guelmim, or you can do the assembly together as a teamwork on site. 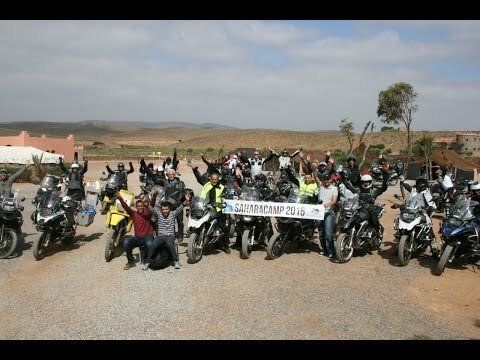 Gerard was also able to deliver two rental motorcycles from Agadir for about 180 euros per day at short notice, when unexpected newcomers appeared and were expecting rows of rental bikes in the middle of the desert. The promised quads could be picked up in Sidi Ifni and driven for 30 euros per hour or 150 euros per day. What you could not see was still available on request for the participants. Like everything in Africa, it only costs a little time and money. A personal rescue helicopter on site with boring in the sun emergency doctors, however, you can not seriously expect for 150 euros per week contribution. In Guelmim there is the nearest hospital. For just 10 euros a day we rented an 80 cc moped for Pia the next day. Like the fishermen and shepherds here, she was faster on the terrain than some of her competitors with her BMW 1200 GS. Since even difficult stages such as the river passage for Pia were a breeze, she was even allowed to accompany a group on the election tour. 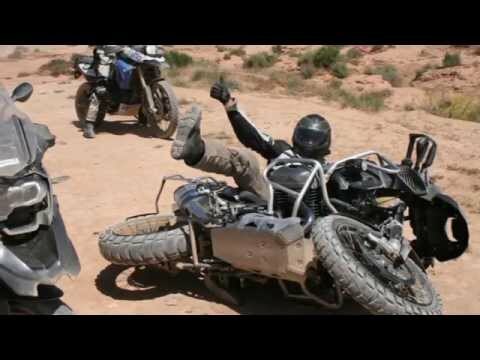 A Swiss couple with rented 1190er KTMs for 180 Euro apiece and day did not dare to do this offroad tour. Less is often just more. Like a goat, the little moped jumped from stone to stone. Pia drove up like a professional rider. When at the end of this demanding off-road stage the chain of the moped ripped, I dragged it with a strap from footpeg to footpeg. We only wrapped the strap around Pias Raste so that she could hold it with her foot and disconnect if necessary. In this way, the moped could even keep up on the asphalt track with the big BMW. in the Enduro per mode by setting a special connector under the seat disable. If you know it. Here it came to the fall of a participant, the mountain down suddenly had no more braking effect. Otherwise, it came abgesehn of a in my opinion BMW typical Kardantunnelbruch fortunately to no further incidents. The weeks passed in flight. In between we met our friends from Hechlingen at the caves of Sidi Ifni with their guided Morocco tour. For people who are good on foot, the caves are a great photo paradise. Along the beach you can walk through some of these caves. For cooling off in between, the sea is always within reach. There was also a little cooling off when Gerard suddenly announced his departure. So now I held the flags alone and spontaneously addressed the wishes of the last participants with my tour suggestions. That's the advantage of a small group. Even without the hustle and bustle, we spent some super relaxing days, visited the hot spring, the camel market and the dead whale. I'm still sick. When I kept half the camp alive at night with my cough, we met a veterinarian who was traveling with her husband in a huge truck while traveling in Morocco. On board of the 6x6 truck was also a well-equipped pharmacy, from which I was supplied with cough syrup. We met the truck occupants again on the white beach, as I once again wanted to lead a group to the shipwreck. Gastfreundschaftlich we were all invited to the coffee, as my yellow machine, which increasingly caused problems, suddenly did not want to start. When we then wanted to tow the machine by lashing strap and I tried a gear by hand, she then started again. Presumably she had wanted to help us in this way simply to a nice coffee round on the otherwise deserted beach. In this way, even a breakdown had something positive. Less positive is the fact that all documents and authorizations of the car and the motorcycles still run on Mohamed. At customs in Agadir, we were twice unable to rewrite the documents. Mohamed was supposed to drive the car to Germany originally. But he flew home when it came to the dispute, because he should organize as a local firewood for our campfire. He was not here for something like that. That was below his dignity. After the camp I packed the bikes and all the stuff in the VW Crafter and headed for the 1100 km long road to the border. I passed numerous police checks. In every small village the street robbers lurked with their laser pistols. In Morocco, as in most countries, the danger does not come from robbers or Islamist terrorists but from the police themselves. Suddenly I was waved out despite the correct speed. The policeman said something of "faction" "faction", pointing to my broken daytime running light in a country where there are more donkey carriages than cars. I explained to him that there were no spare bulbs in Guelmim and that I would have it repaired in Agadir. The policeman wanted 30 euros. I explained that I have fueled my last money. All I have to do is go to Agadir with my friends. He forced me to drive. Somewhere in the Anti-Atlas I opened my tent and slept off the street. Unfortunately, there was no question of sleeping. First the megaphones of a mosque crowed somewhere nearby, then music was played on the same loudspeakers. When this was finally over, dogs began to bark and did not stop it all night. Completely kidnapped, I set off again the next morning. 800 km were still in front of me. Again, I was waved out at one of the numerous police checks. The policeman wagged the famous book, on the title of 700 dirhams so 70 Euro penalty. At any point I drove 100 km / h instead of 80 km / h. Of course he wanted money. It was not about safety. It was clear to all that I did not drive unsafe and here even 160 km / h are possible. Again, I explained that I do not even have money for food or a hotel and my destination is the nearest city. He pulled me aside and said, "Ok give me 200 dirhams." Of course without a bill. Tired as I was, I asked him if I could stay in his police car if he did not want to let me continue. Even for corruption, I have no money. Startled, the official dismissed. He should be kind to someone else? He could not agree with his status. I got my papers back and was allowed to continue driving. On the way I collected a hitchhiker who was on the way back to Holland. 50 hassle-free controls later we were pulled out just outside Casablanca again. Somewhere I drove 26 km / h instead of the allowed 20 km / h. Now the policeman wanted 30 euros from me. For a tenth of the price we had previously bought more grilled sardines than we could eat together. I explained to the policeman that I had just spent my last money on sardines. Although I am very hungry, he should have it now. I squeezed the greasy bag of sardines against his clean uniform. Without a word, the officer handed me back my papers and waved my neighbor out. I love Africa !!! A few hundred kilometers further. I talked to my hitchhiker, enjoyed the barren, wide landscape, and thought of nothing wrong when suddenly I saw a policeman lying in the middle of the pampa with his laser pistol. A quick look at the GPS and I realized that instead of allowed 120km / h I was traveling at a criminal 124 km / h. By now I was so fed up. Everywhere these bloodsuckers. Instead of traffic and the road you have to focus on completely irrational and constantly changing speed rules. At the next inspection a few kilometers further I drove extremely close to my front man, so that no money-gripping policeman could jump in front of the car. As expected, I was waved from the side standing out, I waved back nicely and drove on. 5 minutes later we rolled aboard the ferry and arrived in Spain 2 hours later. Here I enjoyed the return journey through the beautiful landscape of Spain and France off the toll roads and stayed in the tent for free. Traveling is fun. After 12,000 km in two months by car and a few thousand with various motorcycles, I delivered my cargo punctually in Munich. A week later I received a letter from Switzerland. The highwaymen wanted there 40 euros from me, because I allegedly drove when eggs with 50 km / h 300 km over land somewhere ridiculous 5 km / h too fast. At the same time, I really tried to stick to all the most pointless rules. In this nasty way I was the complete tip that I got during my work as a tour guide, stolen by the police. At least I had saved the equally expensive motorway vignette. PS Some weeks later, Touratech volunteered. The mechanics had found the reason for the bad starting behavior of the yellow BMW: Lack of compression due to defective valves after just 6 weeks. Total loss. BMW stop. Next.